Olafr Sigtryggsson, who was king of Dublin and Northumbria in the mid 10th Century minted two different pennies that depicted Raven Banners. The coins were minted in York in the 940s. A Raven Banner is described in the Orkneyinga saga, written in 1230 in Iceland. It is about the history of the Orkney Islands. It says Sigurd the Stout, the last heathen Earl of the Orkney Islands, flew a Raven Banner. He died in 1014 fighting alongside the Irish High King Brian Boru in 1014. 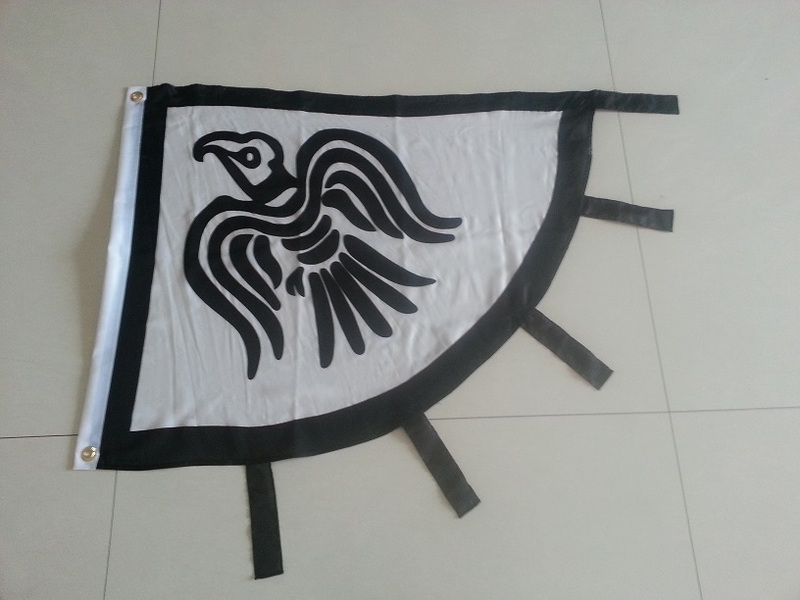 The flag is currently available as a 3'x4' rectangular flag. A 2'x3' Banner with streamers. A sewn cotton 2'x3' Banner with streamers. A sewn cotton 3'x4' Banner with streamers.